* You cannot integrate two separate RepairShopr Accounts into one Quickbooks Online account. QuickBooks has been a very powerful integration with a lot of complexity. This will be a long article, we try to summarize and keep the deep dive stuff toward the end. **Note, if your authorization doesn't go through, contact Intuit to fix your Intuit ID. 9. 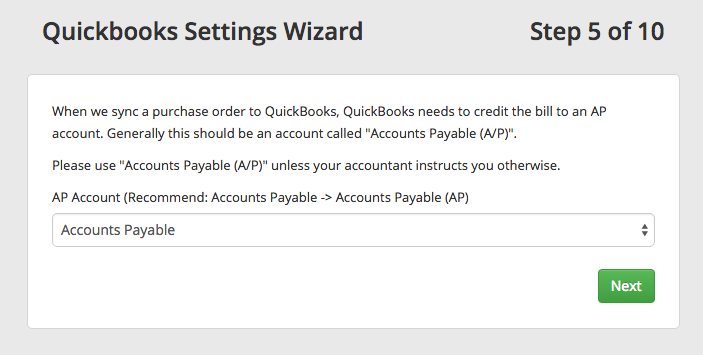 Select your "Accounts Payable" account, where your purchase orders should go to (probably just "Accounts Payable"). If your purchase orders don't sync it's probably because this important step was done incorrectly. 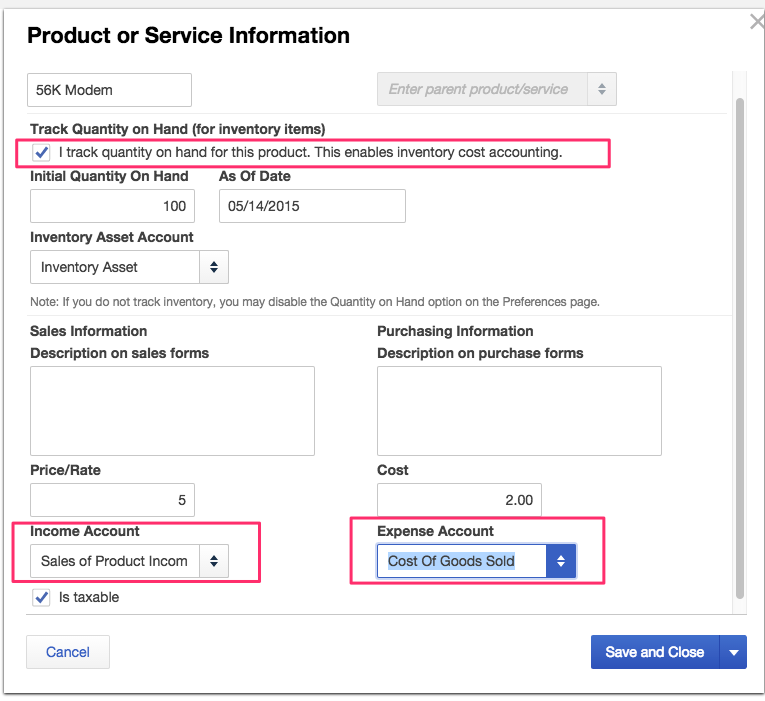 Also, note that when a Purchase order syncs over to your Quickbooks account you must create the bill and pay it to receive the items in your inventory. Then you can go back and receive the items inside RepairShopr. If you receive the items in RepairShopr first, it will close out the PO which means you will need to re-open it again to bill it. It is easy to miss a closed PO so be sure to bill it and receive it before closing it in Repairshop to avoid discrepancies in your AP account and inventory. 10. 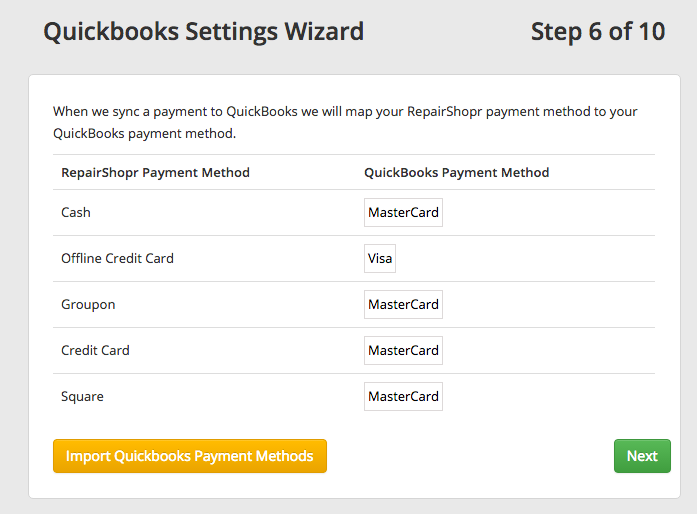 Map your QuickBooks payment methods to your RepairShopr payment methods. If these ever get out of sync due to changes on either side, payments will not sync over. Optional Imports - Highly Recommended! We highly recommend on the next wizard steps that you DO import customers, this will ensure the ones that exist in QB will map to a Customer in RS. So the next invoice created for that customer will get sent to the right one. Same for products, vendors, etc. The only reason to NOT import products would be if you have tons of products in QB that you don't want to use in RS. In that case, skip that step. Importing Vendors will pull in ALL your vendors into RS. 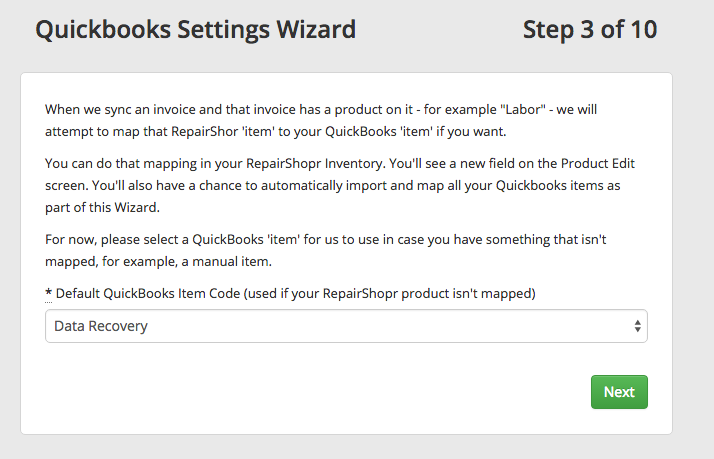 In RepairShopr we don't have a concept of sub-customers, but QuickBooks does. The way this is handled between the 2 systems is that RepairShopr treats sub-customers like "regular" customers in RepairShopr. When we import your customers, we'll try to import each sub-customer. If they all have the same email, they may attempt to update each other on the RepairShopr side. Give each a unique email one way or another in QB before importing for the smoothest import/setup. 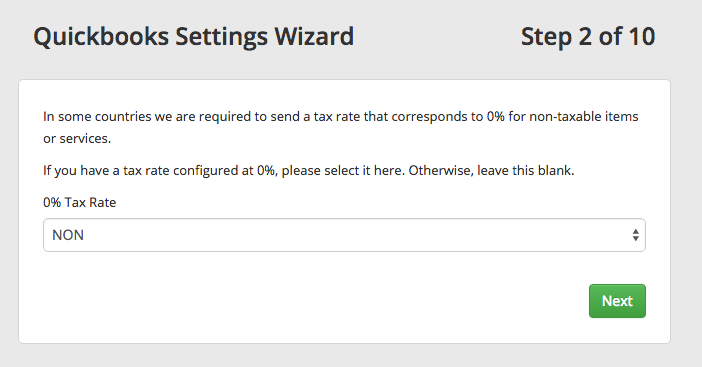 We support the use of Tax Groups / Grouped Tax rates in Quickbooks Desktop. Items categorized as Labor in RepairShopr need to be mapped to items with the "Service" type or when they are created they need to be changed from "Non-inventory" to a "Service" type item. If you have a Big Chain account with RepairShopr, you may want to track invoice data from each of your locations. To do this, you'll need to set up classes. 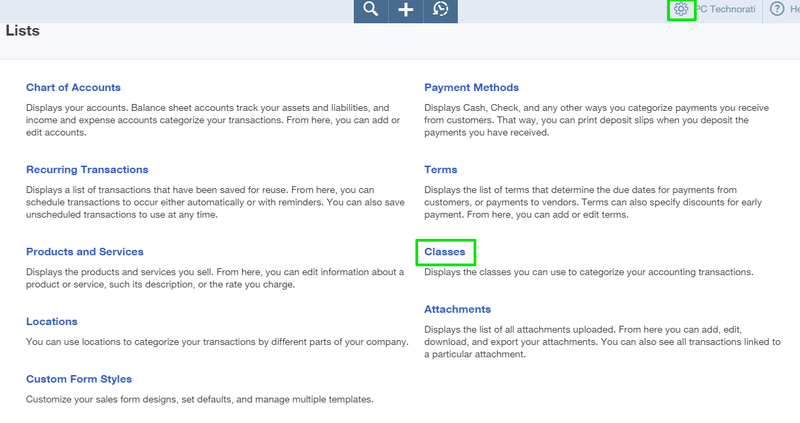 Note this is a Quickbooks Online only feature. 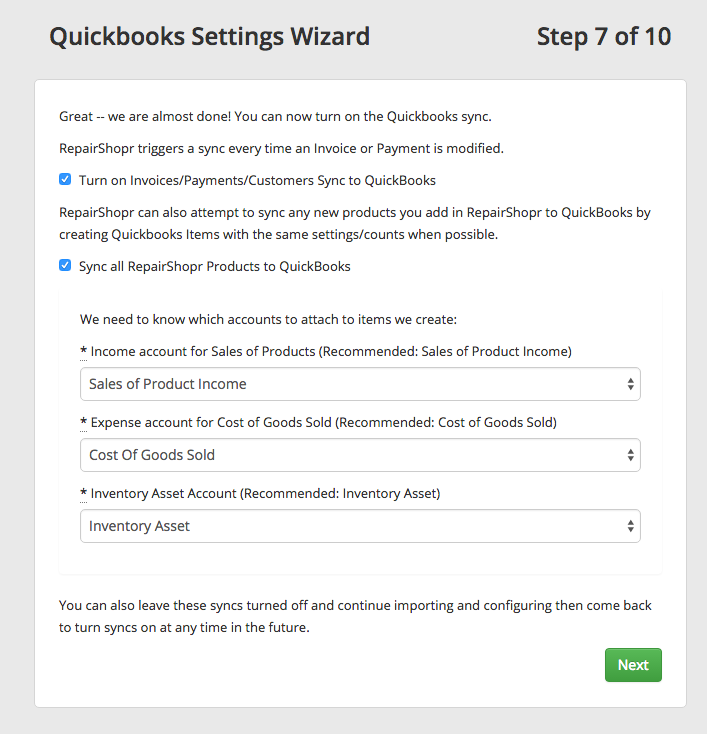 After you've connected your Quickbooks Online account with RepairShopr, go to your Company Settings page in Quickbooks Online. From here, you'll turn on classes tracking. 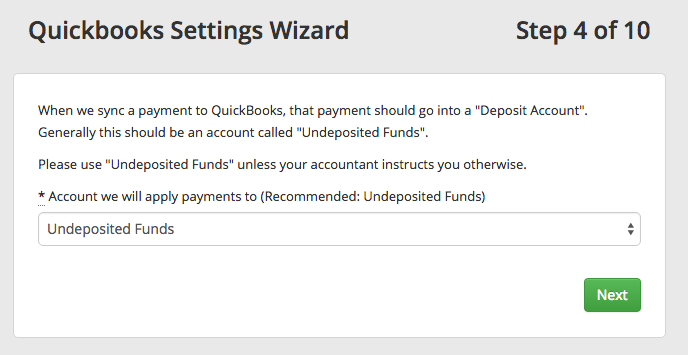 If you don't have this option, you may need to upgrade your Quickbooks Online account. Then, click the gear icon in the upper-right, select 'All Lists', and click 'Classes'. From here, add your classes. You'll probably want them to match the names of your locations in RepairShopr, just to make things simple. Now head over to RepairShopr, and go to Admin > Locations (big chain). You'll want to click 'Refresh QB Classes'. Click 'Edit' next to each location, set the appropriate class, and you're done! 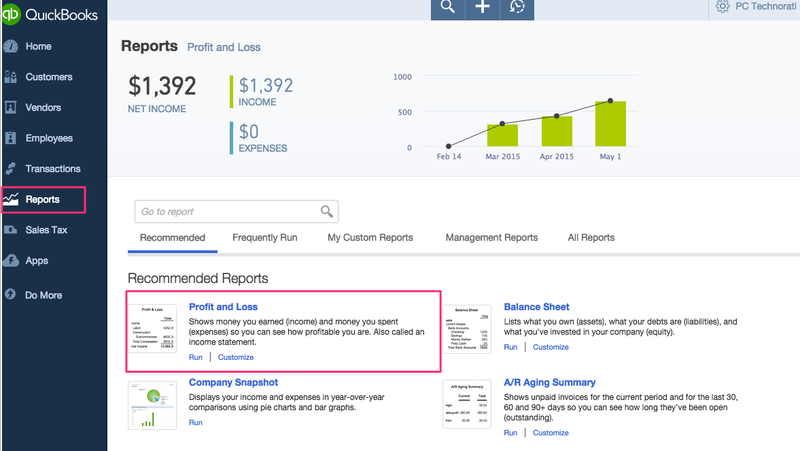 Now you can run reports for these classes in Quickbooks Online to see your sales per location! Make sure you enter a "Price - retail" and a "Price Cost"
Make sure that you check "I track quantity on hand for this product"
Income account should be "Sales of Product Income"
Expense account should be "Cost of Goods Sold"
4. 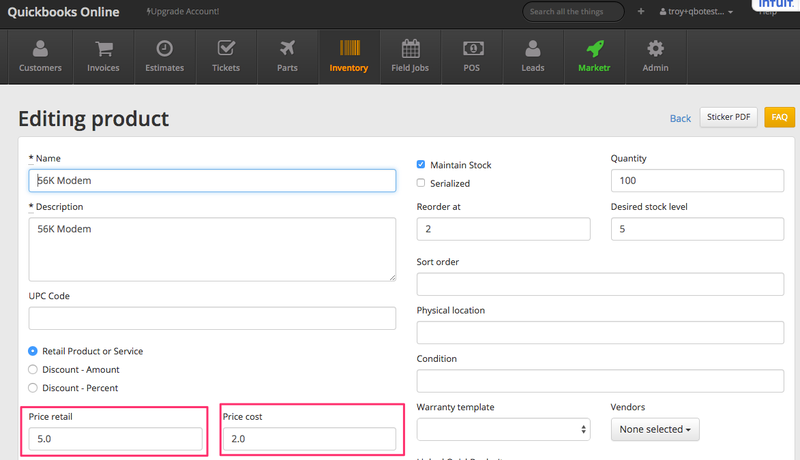 Add the item to an invoice in RepairShopr. 7. 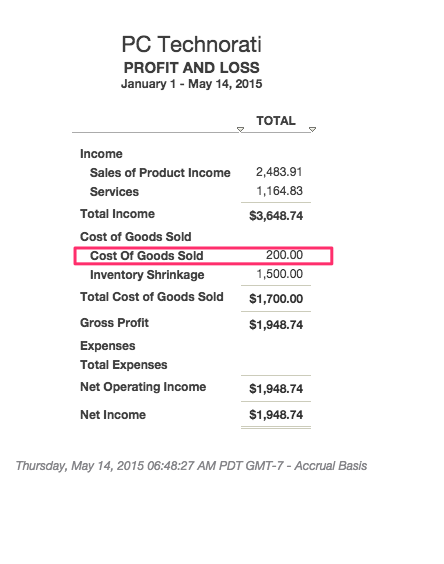 To view the Cost of Goods Sold report in QBO, navigate to Chart of Accounts and search for Cost of Goods Sold. 10. 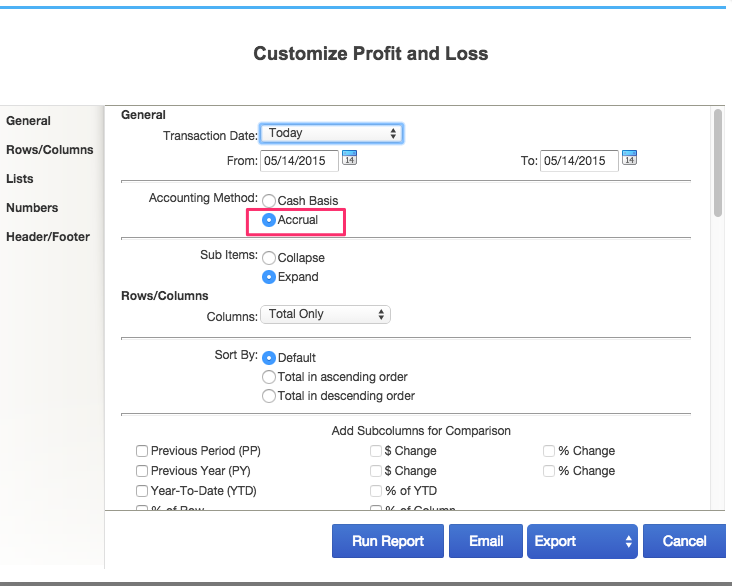 If COGS isn't showing up by default on your Profit and Loss Report, click "Customize" to make sure that the Accounting Method is set to "accrual"
For this to work, you'll need a Quickbooks Online "Plus" account, which includes inventory tracking. After that whenever you set a PO to "Finished" Status, a Bill will be automatically created in Quickbooks so that you can pay your vendors. 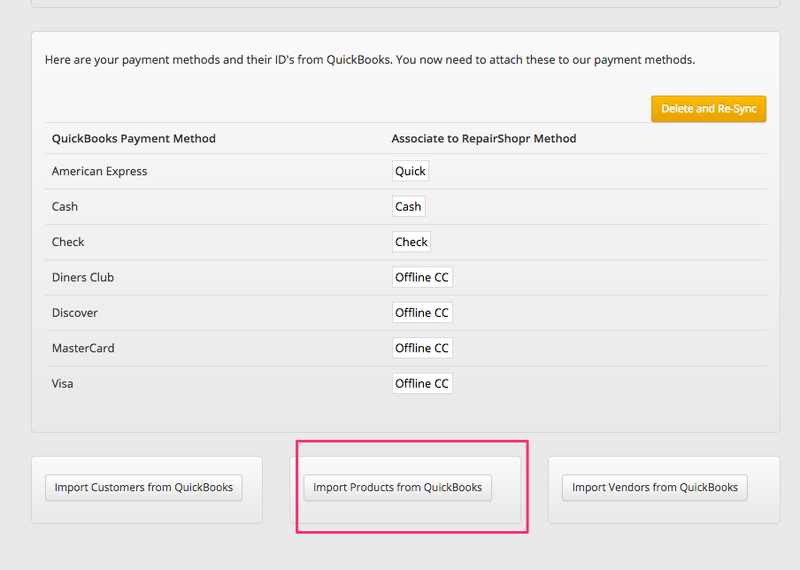 It is possible to have payments created in QBO automatically sync to RepairShopr. 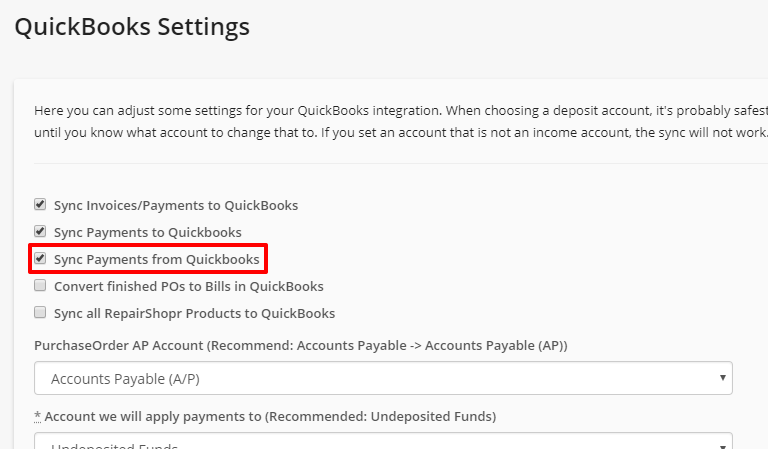 To activate this feature, head to the QBO Settings in the RepairShopr App Center, then locate the setting "Sync Payments From Quickbooks," check the box and hit Save. 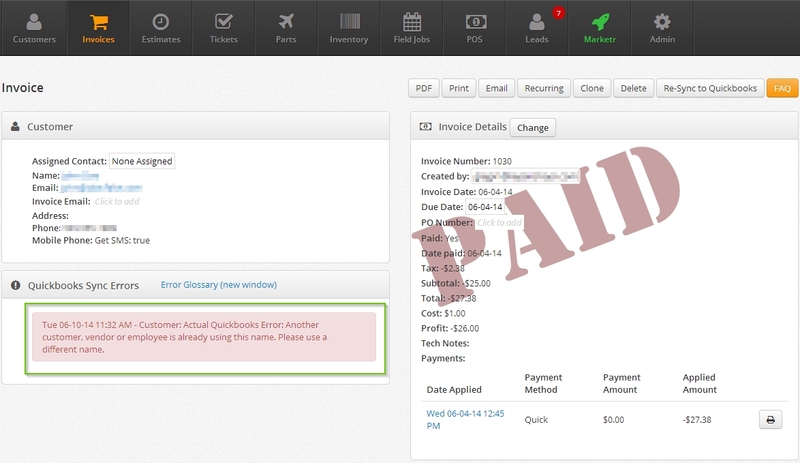 - You must create the invoice in RepairShopr and have it sync to QBO successfully. If you're looking to convert from Quickbooks Desktop to Quickbooks Online, please contact RepairShopr's support team at help@repairshopr.com. We support conversions when your Quickbooks Desktop company file is converted to Quickbooks Online per Intuit's recommendations. There are also steps we need to handle on our end. We're happy to help with this conversion -- just contact us help@repairshopr.com so we can help with planning the change. If you have a failed sync, you'll find a Re-Sync to Quickbooks button. Use this button and wait a minute to see if the Invoice/payment goes through. In the even that you are getting an error that the customer is not correctly linked to it's QB counter part or has no QB ID at all. You can use this tool to match it up. To start, head to the Customer's Customer Detail page. There is a new button along the upper right. You will be taken to a screen that displays the RS customer information and the QB counterparts information if the customer has a QB id. Click the Red button, will allow you to choose a customer to link the RepairShopr customer to a customer in QB. Seriously CAUTION here. If you aren't careful you can link customers to the wrong person, so if you are uncertain, please write support and we can help you. Once you have done all that. Head back to your invoice and hit the resync action and you should be good to go! This error indicates that the customer is not mapped to the corresponding customer inside QuickBooks. To clear this error follow these steps. 3. Locate the customer in the search bar, the names need to be an exact match for the system to locate the customer. 4. Select the customer and then click on "Re-Map"
5. 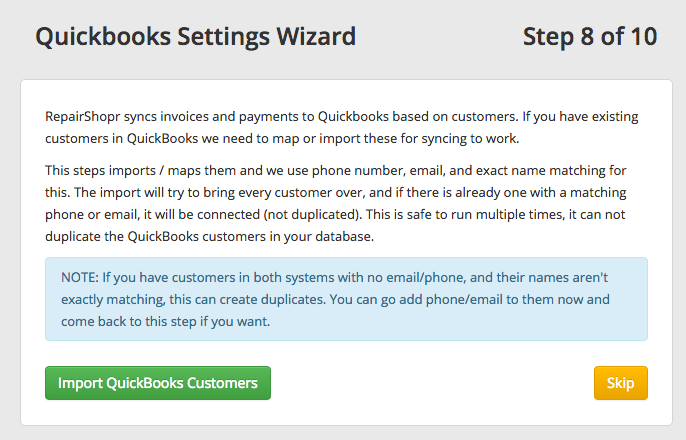 Head back to the unsynced invoice click on "Actions" and then click on "Resync to Quickbooks"
Note that this will remap the customer but if there are any additional invoices they will lose the sync id so they will not have a sync icon. When a store credit is created it will become a credit memo inside your Quickbooks account. It does not get deposited into an account until it is applied to an invoice. Once the credit is added the credit memo will disappear.